Past Friday’s afternoon, around 3 pm, I was at university, specifically I was in one of the libraries and I was reading a book titled “Concurrency”; it’s about engineering concurrent systems using the modelling software LTSA and then write the actual program in Java. While reading I was also talking with two friends of mine about a problem another friend found on a book; to make a long story short, the problem was about balancing a predefined non-balanced random function. One of these two friends showed us how he solved the problem, the algorithm he wrote was written in Python. When some hours later I was back home I did thought it was finally the time to install a Python interpreter and start playing with it. So I did it. I got myself the latest release of Python interpreter and the Pydev plugin for Eclipse IDE, installation and configuration on Windows is incredibly straight forward, just a matter of pressing install and next 2 or 3 times. I don’t have any Python book then as first programming guide I used the well known (at least here in Italy) html.it site, if you are not Italian just google Python and you will find a huge amount of interesting PDFs and guides of any kind. 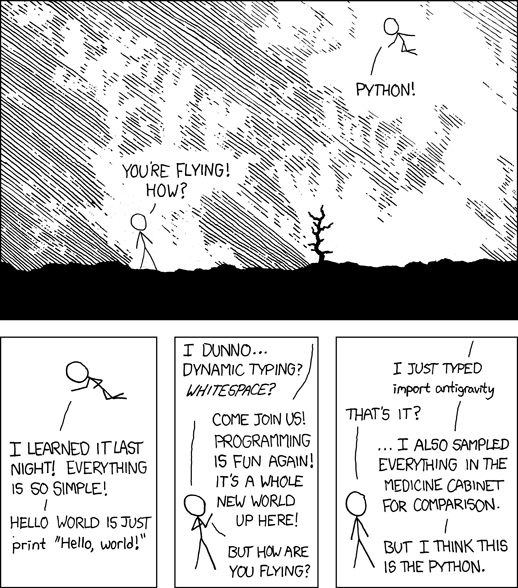 What really makes Python AWESOME (yes, awesome in lowercase is just not enough to describe how really great Python is) is it’s simplicity: there is no typing, no need to open parenthesis and syntax is really super easy. It’s unbelievable close to the pseudo-code we see every day on the books but is also so powerful, definitely it is the best programming language I have ever used. Check out the “Programming ‘n’ stuff” section to see my Python programs (actually there should be one).